While our adversaries are understandably anxious to face us in court, we reduce our clients' anxiety and fear of lawsuits by simplifying the civil litigation process. By educating our clients on Maryland laws and legal options, we work as a team to investigate evidence, form trial strategy, and prepare for effective trial testimony. Our Maryland litigation attorneys also share their legal expertise and trial experience with Maryland business leaders, executives, community organizations, and consumer protection advocates seeking information on their legal rights in state and federal courts. As a former professor of Evidence Law and Civil Procedure, Irwin Kramer has taught thousands of trial lawyers and law students seeking to enhance their litigation skills. 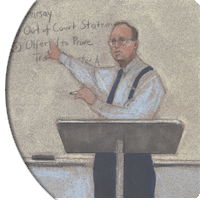 Beyond law school courses and continuing legal education seminars, Mr. Kramer has prepared law graduates for bar examinations in several states. He and Jim Connolly continue to publish articles on trial advocacy, legal ethics and tort law, while presenting popular seminars for the Maryland State Bar Association, the Bar Association of Baltimore City, the Baltimore Claims Association, and the Maryland Land Title Association. If you would like to arrange a legal education program on a topic of interest to your organization, please feel free to schedule a legal seminar for your company. The legal information on continuing legal education law review and law seminars for Maryland business leaders community executives and lawyers on recent legal developments Maryland civil lawsuits investigate evidence litigation strategy prepare for trial testimony insurance bad faith litigation anxiety of litigation fear of lawsuits negligence tort law legal ethics trial advocacy Maryland State Bar Association Bar Association of Baltimore Claims Association Maryland Land Title Association, is designed for informational purposes only and is not intended to constitute legal advice. The slogans, High-Speed Access to Legal Action, Legal Advice, Legal Counsel, Legal Protection, State & Federal Courts, Dispute & Conflict Resolution, Probate Protection, Legal News, Legal Training & Seminars, and the substantial equivalent thereof are service marks of Kramer & Connolly. As a client service and as a public service, Kramer & Connolly attorneys lecture frequently on issues involving Maryland law, where they share practical insights drawn from actual litigation experience. At Kramer & Connolly, our attorneys believe that scholarship and outstanding legal representation go hand in hand. Moderated by Kramer & Connolly managing partner, Irwin Kramer, this nationally-televised program featured an all-star panel of lawyers and journalists exploring ways to serve the public's interest in legal news without disrupting a system of justice designed to protect the rights of litigants. The second part of the C-SPAN program involved a debate over the impact of headline news on the system of justice. Part III of this C-SPAN Broadcast dealt with the manner in which members of the media cover high-profile trials.